Bumbu Desa, one of Indonesia’s largest chain restaurant has been around in Malaysia for 5 years already. In 2010, Bumbu Desa has been awarded the “Most Favourite Sundanese Restaurant” by Tourism Indonesia. 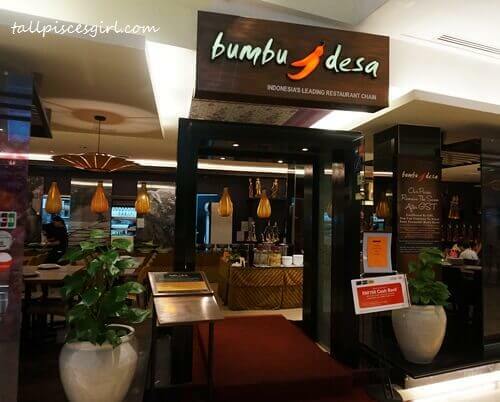 There are currently two Bumbu Desa outlets in Malaysia; one at Suria KLCC and the other at KLIA2. 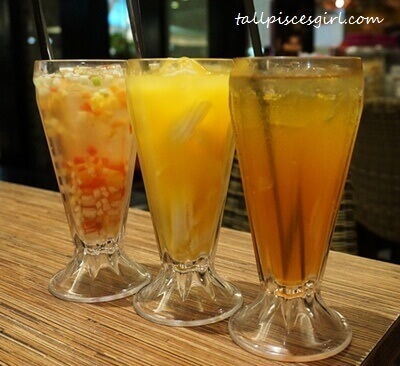 I was invited to Bumbu Desa @ Suria KLCC to sample their set menu. 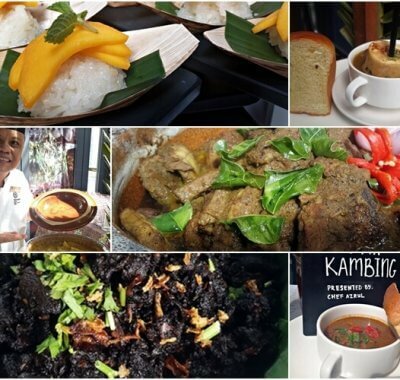 Priced at RM160++ and designed for 4 pax, we certainly had an awesome time feasting on authentic Indonesian cuisine. 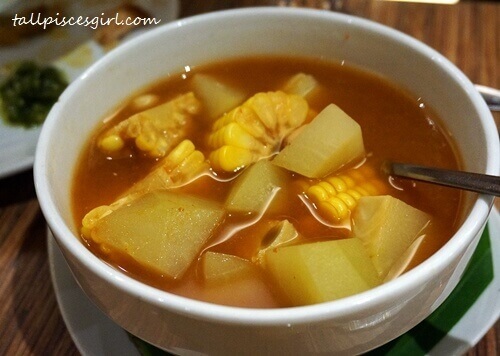 Before having our meal, we had Sayur Asem (soup) as an appetizer. 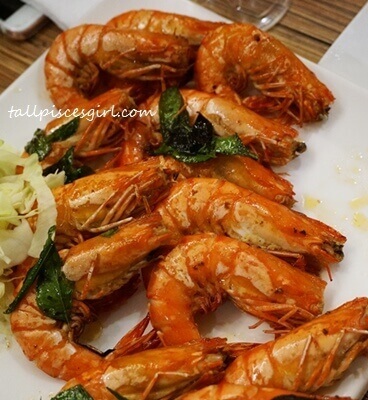 Boiled with a generous amount of quash and corn, its sweet and sour taste opened up our appetite. 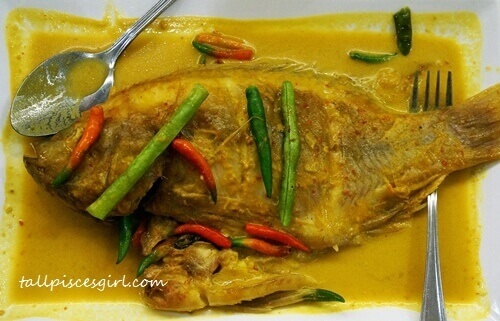 Gulai Talapia is one of the most popular dishes at Bumbu Desa and definitely our favorite too. 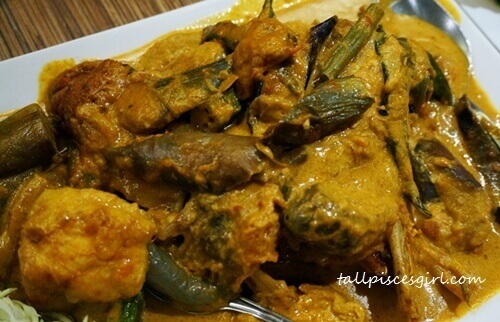 The succulent fish meat and the aromatic fish curry cooked with various spices and herbs goes very well with rice. 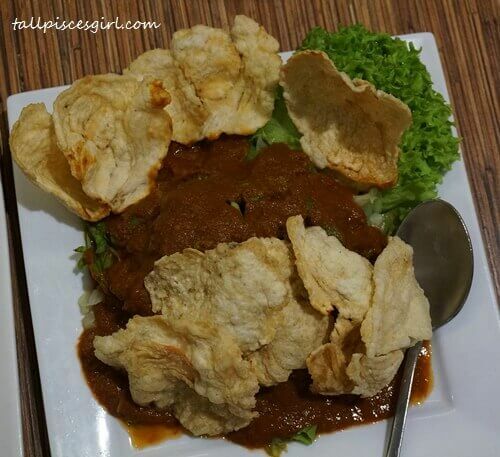 Tempe Mendoan, deep fried battered fermented soybeans (tempeh) is deliciously piquant with lots of sauce. Gado-gado, a popular street food in Indonesia just like our rojak has mixed vegetables, boiled egg and tempe topped with sweet and hot peanut sauce dressing. 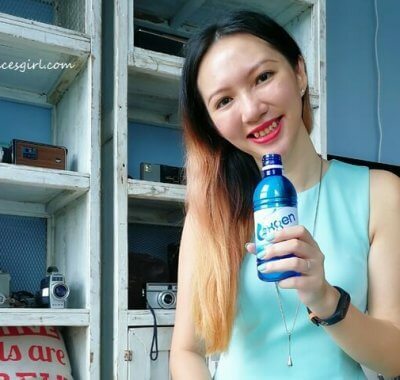 Served alongside with crispy emping (crackers)! 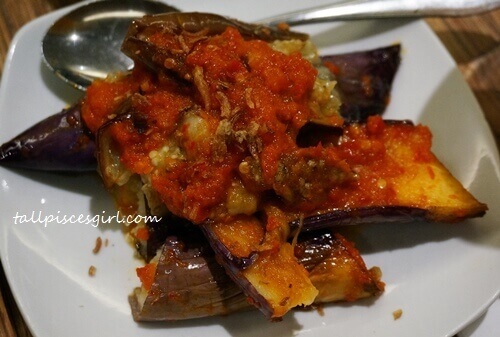 This brinjal served in fiery hot balado brought me tears. Balado is one of the many kinds of sambal originated from Western Sumatra. The basic ingredients to make balado are chilies, tomato, shallots, salt, sugar and lime. 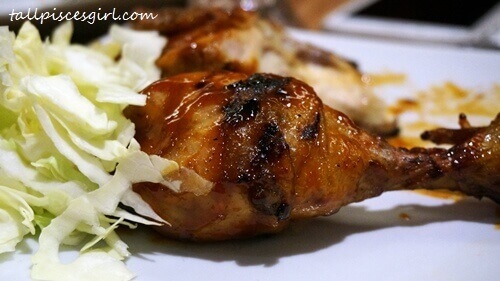 Ayam Bakar (roasted chicken) from Bumbu Desa was perfectly roasted; doesn’t look too charred. The mildly spicy sauce drizzled on it was a good match. Ayam Cabai Ijo is strictly not for the faint hearted as the spiciness will send you to the moon and back. The chicken was marinated with lots green chilies and spices before being cooked. That explains why it was still super spicy even after I’ve removed the chilies from the meat. 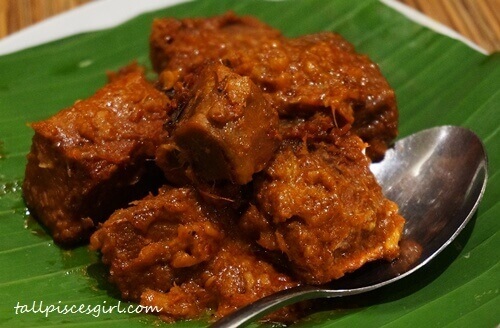 Delectable slow-cooked succulent beef accompanied by fragrance yet spicy rendang. 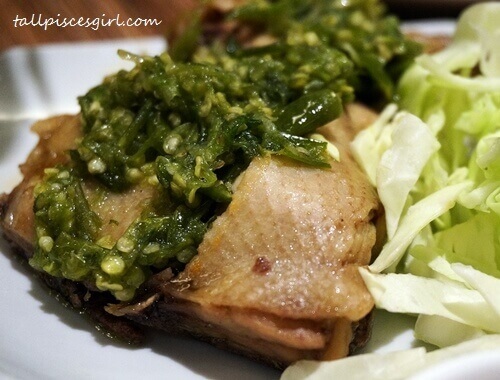 Ayam Bumbu Desa is their signature dish that I would totally recommend you to add-on. 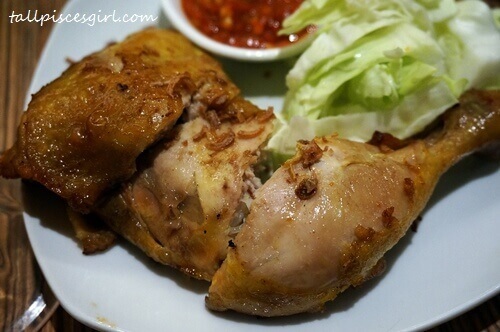 It is deep fried chicken marinated and cooked with hot spices (sambal). 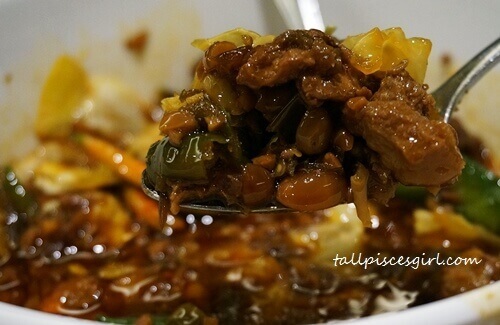 Tongseng Kambing is a mutton stew dish and Clumsy Boy loved this so much, he kept getting more servings. 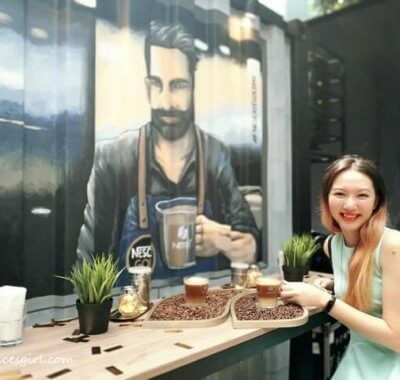 According to him, the sauce was very flavorful and that’s why most of them went to his plate of rice! 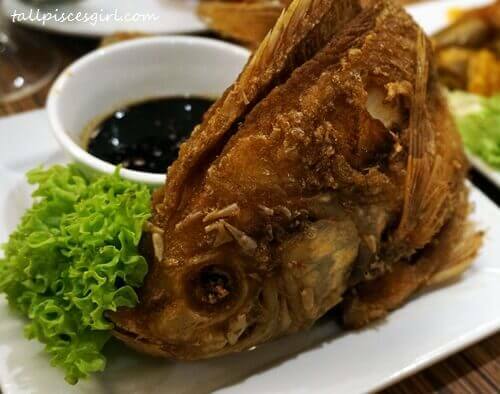 Deep fried marinated talapia fish that even people who couldn’t tolerate spicy food can eat. Ended our feast with yummy, sinful dessert – Pisang Sos Caramel! 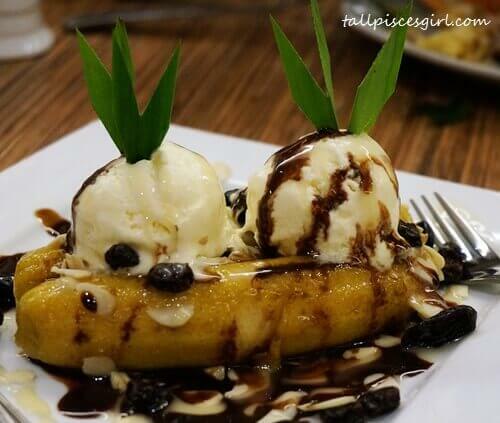 2 scoops of vanilla ice cream accompanied by banana, drizzled with caramel sauce – excellent for sharing.